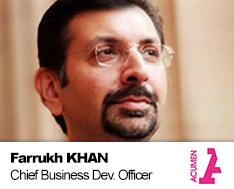 Farrukh H. Khan is the Country Director & CEO of Acumen Pakistan and one of the leading independent business and financial advisors in the country. Before founding BMA he worked with American Express Bank in Pakistan and Deloitte in London. He has previously served as the President of the Overseas Investors Chamber of Commerce & Industry (OICCI), Pakistan Chapter Chairman of the Young Presidents’ Organization and on various private and public sector boards. Farrukh qualified as a Chartered Accountant from the UK and read BA (Hons.) in Economics and Finance from the University of Manchester.